1. The girls returned to school last week. Yup, middle school. Take a moment to let that sink in. Middle. School. A part of me wants to be all like "Oh, I can't believe my babies are in middle school! "but, really, I've been here for the past 11 years, so yeah, middle school. Anna, obviously, has had the biggest transition. She spent the past three years building a relationship with two wonderful nurses and now she needs to start all over. Thankfully, I've been told that these nurses are just as wonderful, but it's still a difficult transition. 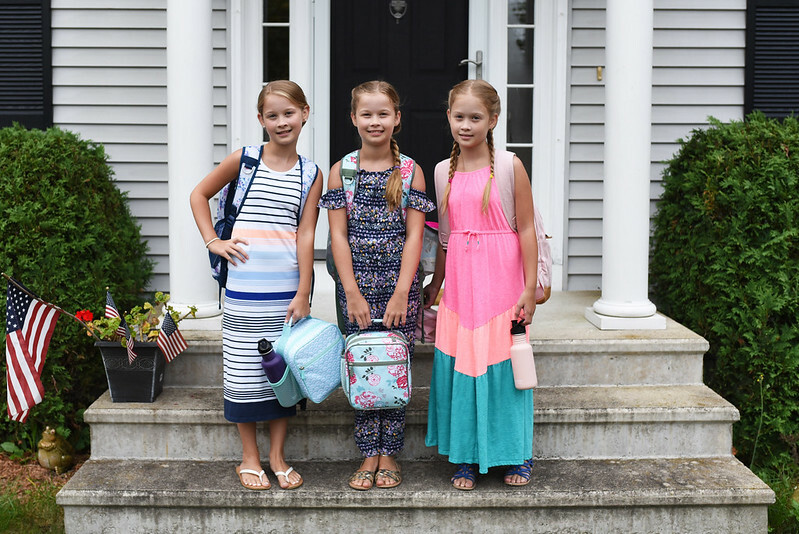 The girls experienced a combination of nervousness and excitement leading up to the first day of school. In a way, I wish the school system was structured how it was back in the '80s with 6th grade still in elementary school and 7th and 8th grade as junior high. I feel like, maturity-wise, there's a big difference between 6th and 7th grade. The school supposedly does a good job of keeping the grades separated - for example, you only have lunch with kids from your grade - and the girls actually know quite a few 7th and 8th graders from dance, so I'm not really concerned with the kids. It's more to do with everything different that comes with middle school. They also had to complete a two-sided worksheet, which asked them to name their favorite book read over the summer, what was their rating of the book, along with the book's theme. There was space to rate four other books. The backside of the worksheet was a bingo card (25 boxes) related to reading. For example, "read to a stuffed animal," "read while eating a bowl of ice cream" and "read in the car." My motion sick kids loved that one. I told them it doesn't say the car has to be moving. At the very least, they had to get bingo. If they completed all the boxes, they'll earn a homework pass. 3. Being a middle schooler means that you are on a rotating schedule and move to different classrooms for each and every class. There are 7 periods a day - Math, ELA, Literacy, Social Studies, Science and 2 Specials. What's interesting is that you keep the same 2 Specials for the term, so you have those Specials every single day. When you have gym, you have gym every single day. You have the option of wearing gym-type clothes and sneakers, or changing. From what I've been told, most kids wear versus change. Thankfully, my kids don't get smelly. Ha ha. But I'll need to have a huge supply of "gym" clothes or run extra loads of laundry because it appears that they'll have gym during the same term. 4. Each grade has 3 teams. Team placement is supposedly random. There is some truth to that, but it would be impossible to be completely random. At first, I thought they may split the kids up based on ability but at this point, kids mainly know who gets good grades and who doesn't. You don't want to end up with labels, such as "The Smart Team." Plus, some kids may do really well in some subjects but have difficulty in others. Each team shares the same set of teachers. If you are on Team A, you have the same math and ELA teachers as every other kid on Team A. You may not be in the same class, but you will have the same teacher, the same homework, the same exams. The girls are all on the same team this year. The school automatically places multiples and same-grade siblings on the same team and we would've had to have requested separation. 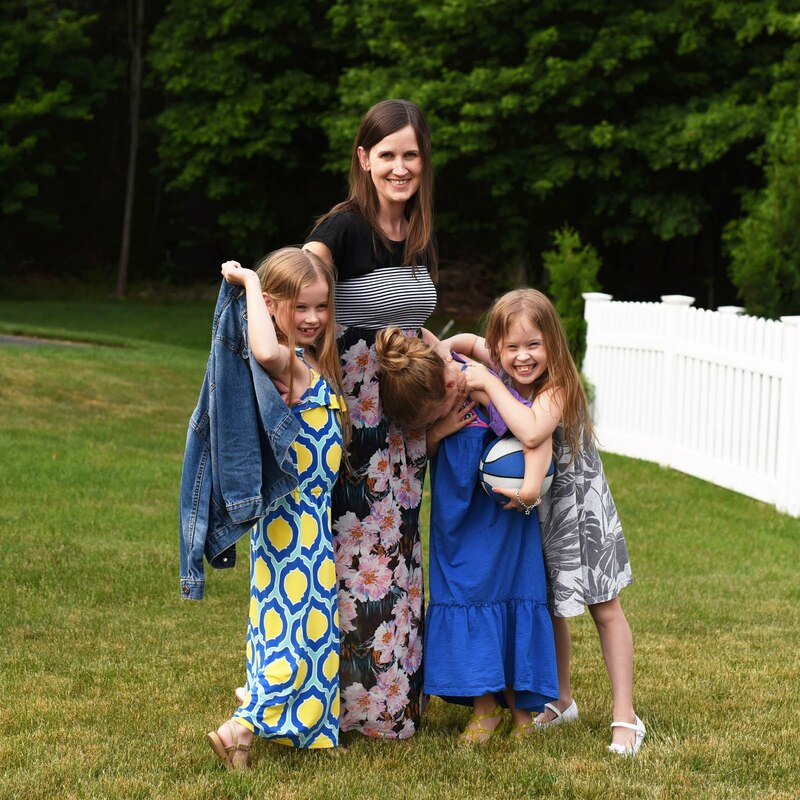 Being on the same team makes it easier for the entire family, even though the girls may not necessarily see that right now. For example, when Rich and I go to Curriculum Night, we wouldn't have been able to hear all of the teachers speak. Even if we split up, there are only two of us and three of them. The girls knew they were going to be placed on the same team, so it wasn't a surprise. I would say that they're ambivalent towards it. No one loved the idea, but no one was fighting it either. Of course, there was some drama over finding out which team they landed on. Placement letters were supposedly mailed out (yes, via snail mail) on a Thursday. The next day, most kids at the elementary school, but only a handful of middle schoolers received their letters. Saturday morning, we left for the Cape. I checked the mailbox one last time as we pulled out of the driveway as sometimes the mail is delivered early. Nothing. So all day I'm seeing parents post on a FB group which team their middle schoolers were placed on. Parents of the girls' friends texted me as well. The girls were freaking out because everyone knew their team. Also, most of their friends were on a certain team, and they knew a disproportionate number of kids on this particular team. When we finally arrived home at the end of the weekend, there was squabbling over not yelling out the team when opening letters so as not to ruin the surprise for others. Sigh. They were placed with most of their friends. Yay! There are about 100 kids per team so just because you are on the same team, doesn't mean you will be in the same class. When the girls came out of school on the first day, they immediately told me which friends were together with them in class. They didn't tell me until after we arrived home that they actually have classes together! I would have expected them to tell me that first. So, not all three are together. Emily and Anna have a class together, and Allie and Anna have a couple of classes together. 5. I was sort of surprised to learn that the only class based on ability is math. And even then, it's only one additional level. When I spoke to Emily's and Allie's teachers during the parent/teacher conference back in the spring, I asked about class levels/placement for middle school and was told that certain students are placed in Enriched Math, but that's it. Their grades throughout middle school will determine where they are placed when they enter high school. During that meeting and the discussion of Enriched Math, I couldn't get a sense of whether Allie or Emily would be placed in that class. I was only told that the 5th grade teachers work with the 6th grade teachers on placement. End of story. Both girls do well in math and, last year, Emily's teacher had been giving her additional problems to work on. The same occurred in 4th grade, when her teacher actually set up a separate math group with Emily and four other students. But I know Allie was also given more advanced problems to solve last year as well. Emily was placed in Enriched Math. I'm not surprised that Allie wasn't, but I wouldn't have been surprised if she had been. There are only three Enriched Math classes so they had to cap out the number of students somehow. It looks like approximately 20% of the 6th grade students were placed at this level. There were some kids who we expected to end up in Enriched Math and they didn't so it's a bit of a gray area as to the final determination. 6. The girls and I are still working out the best plan for drop off and pick up. Thus far, we really haven't had any issues. 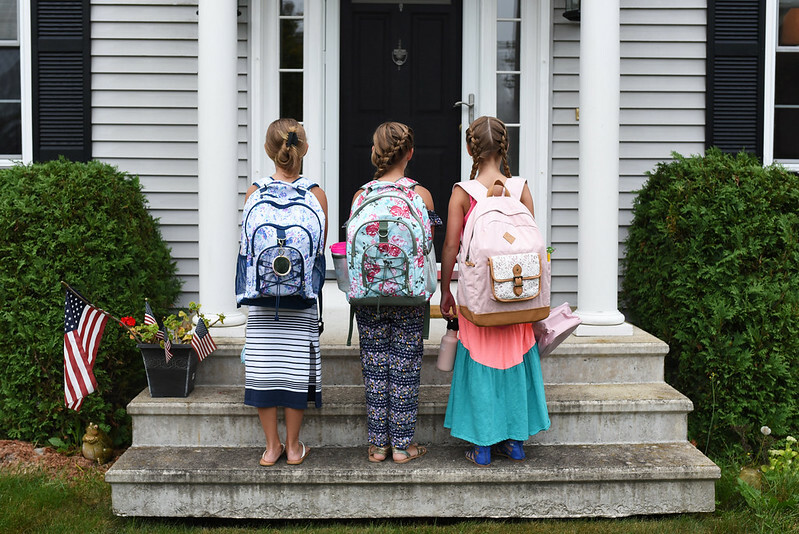 The key is giving ourselves plenty of time in the morning as the middle school and high school begin at the same time so that area can get quite congested. I've been arriving at the school extremely early in the afternoon to snag a prime parking spot and using that time to read. Realistically, I cannot do this every day. There is another place I can park if I arrive later, but I'll get stuck in traffic when we go to leave. 7. One of the bigger transitions for me and the girls this year is having to get up an hour earlier than last year. I am not a morning person and I'd seriously have to go to sleep at 8:30 in order to feel well rested after getting up so early. I feel better when I get more than 8 hours of sleep. I used to sleep less and I survived just fine. I don't know why my body is craving more, but it is. I've known for quite some time that I am far more productive in the afternoon and evening hours. In an ideal world, I would sleep from 2:00 am to 11:00 and then go about my day. When I had zero responsibilities, I once took a month off between jobs and this is what I did. I felt awesome. So, yeah, the sleep thing is tough. The girls have had no problems falling asleep at night. They are exhausted. They've/we've been packing lunches and snacks at night so we can sleep a little bit later in the morning, but 6:10 is still an early morning wake-up call. One benefit to living close to the schools and not taking the bus is having more time in the morning. There are some kids who have to be at the bus stop at 6:30. 8. I finally let the girls get new backpacks and lunch boxes. They'd been asking for over a year now for replacements and I told them to wait until middle school. There technically wasn't anything wrong with what they had, but I will agree that the lunch boxes needed to updated. While their backpacks weren't falling apart, the girls actually did need bigger ones for this year. We went with Pottery Barn Teen and I told the girls to choose wisely because these need to last for at least three years. That's how we roll around here. Disclosure: This post contains affiliate links. TGUH is a participant in the Amazon Services Associates Program LLC, an affiliate advertising program designed to provide a means for sites to earn fees by linking to Amazon.com and affiliated sites. Will Anna be given any accommodations in Gym due to her special needs? Yes. It is written into her 504. She can sit out whenever necessary. that occurred yesterday outside of Boston. Bernice - thank you for thinking of us. We are okay - on the other side of the city. Absolutely terrible for those communities. Which books did the girls choose? From the list, they each chose a different book - One for the Murphys, El Deafo, and All Alone in the Universe. They read almost every day so they ended up reading more than 1 other book.